This ley runs for 13 1/2 miles NW from Wandlebury, across Cambridge and terminates in Swavesy. Its first marker is the great round barrow (49715290) on Wormwood Hill just SW of Wandlebury Fort. Following the course of the ley through the trees and rough grass between the barrow and the ramparts of Wandlebury, the contentious hill figures of the Giantess Gogmagog and her horse are encountered at 494553323 49455323. When this ley was plotted we had absolutely no idea that the line would pass through the figures, which are not marked on the map. They have been allowed to become overgrown to some extent, and are not visible except at a very close quarters. This is apparently deliberate, as the warden at Wandlebury is anxious that they should not be destroyed by casual visitors walking all over them. The Giantess was discovered by the late T.C. Lethbridge who, following up clues provided by legend, folk memory and early accounts of the figures, and using a bar to sound out the ground at the appropriate site (a process call bosing), discovered a number of figures, of which the Giantess (or goddess) and her horse were excavated. The hills on which Wandlebury is situated are called the Gogmagog Hills, In Drayton's Polyolbion (1610) 'Gog' was a giant who fell in love with the neighbouring river nymph, Granta, but Lethbridge argues persuasively that the name referred to the sun, and 'Ma-Gog' was the moon and the great Earth Goddess. Many archaeologists are not convinced by Lethbridge's discovery, but his book Gogmagog - The Buried Gods, makes exciting and convincing reading. 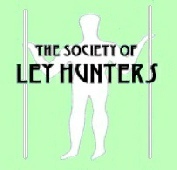 The unexpected position of the figures on this ley is an indication of their authenticity. A few hundred yards along the ley from the figure of Ma-Gog is the camp or hill-fort of Wandlebury (49405341 49335337). This is an Iron Age structure consisting of deep ditches and banks enclosing a large circular area. The site is wooded, and there are modern buildings within the ramparts. The ley passes through the SW segment of the feature. A 13th century legend associated with the camp states that a warrior entering Wandlebury on a moonlit night shouting 'Knight to Knight. Come forth!' will be confronted by a supernatural knight on horseback. Sir Osbert Fitzhugh was said to have struck this weird guardian of Wandlebury to the ground and made off with his horse, which escaped at cockcrow never to be seen again. Lethbridge, naturally, considered this legend to relate to the hidden hill figures. During excavations in the interior of Wandlebury, the gruesome discovery was made of a child's skeleton in an Iron Age grave. The legs had been removed before the flesh had decayed, but for what ritual or purpose is not known. The ley continues across the Gogmagog Hills, providing excellent views down the ley over Cambridge, and passes through the corner of a crossroads below the hills at 48095489. As two arms of the crossroads are formed by a Roman road known as Wort's Causeway the spot is likely to be ancient. After crossing Magdalene College, the ley passes through Christ's College, then goes through Sidney Sussex College (44985870) which occupies the site of a 13th century Franciscan church, destroyed before 1549. The wraith of a former don is sometimes seen in Christ's College and Sidney Sussex College. The phantom appears to be dressed in grey clothes, and frequents the ground between the two colleges as well; this means it must pass along the ley. Christ's College has another haunting, known as the 'the college mystery'. An elderly, stooping figure is seen on occasion at midnight when the moon is full, and is thought to account for the strange, heavy footsteps sometimes heard mounting a stairway of the college. This could well be a separate phenomenon, of course. The ley next goes through Holy Sepulchre, the Round Church at 44895881. It was originally built c.1130 after Abbot Reinald of Ramsey granted the site to the 'fraternity of the Holy Sepulchre' on land that had previously been known as St. George's Cemetery. Nothing is known about this brotherhood, though round churches are usually associated with the Templars. There are only four such churches in use in England, and this is the second oldest after the Temple church (see Set). The ley crosses the chancel. The next ley marker is St. Clement's (44815890), a little further along Bridge St. Behind its 'silly' 19th century tower is a church dating from the 13th century. After crossing R. Cam and Magdalene College, the ley comes to Castle Hill (44575920). This huge Norman mound is situated on high ground previously occupied by a Roman Fort, which in turn supplanted a late prehistoric settlement. From the crest of the mound the towers and spires of Cambridge can be seen stretching away back along the ley towards the Gogmagog Hills; a dramatic site that inspired Alfred Watkins to write his last book. Archaic Tracks Around Cambridge. The ley passes over the SW flank of the mound, in keeping with Watkin's findings that leys tend to pass slightly off-centre of most mounds. Cambridge seems to have its share of UFO's there being nine reported over the town on separate occasions between 1968 and 1970 alone. The ley points mentioned so far have occurred in about 5 miles; if the bearing is extended NW for another 8 miles, two more possible markers are encountered in the village of Swavesey. The first of these sites is the church of St. Andrew (36286940), a large building dating from the early 14th century, with work of later centuries. There are apparently traces, though, of a pre-Conquest aisleless nave within the present structure. The bench-ends display a variety of carvings (19th century) restorations of medieval work, including one of a dragon. In a field beyond the church, on the same line, are the remains of an 11th century Benedictine priory (36226948) visible only as ridges and ditches in the ground.